In the IELTS speaking test you will have 3 parts and the test takes between 11 to 14 minutes to complete. In the part 2 you will be given a task card on a particular topic, and this will include key points that you should talk about. This section of the speaking test gives you the opportunity to speak for longer on a topic. You will be given one minute to prepare to talk about the topic on the task card. A pencil and paper will be provided for you to make notes and write your bullet points. You will have to talk for 1-2 minutes, and then the examiner will ask you one or two questions on the same topic in part 3. Part 2 takes 3-4 minutes in total. 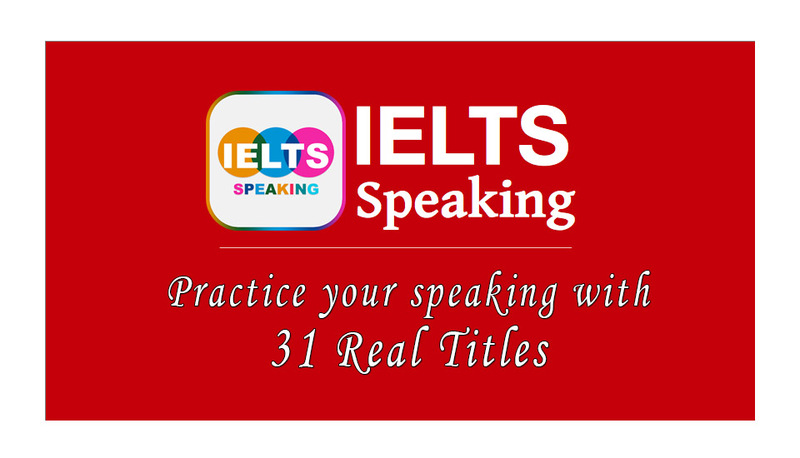 Below you can see 31 IELTS speaking titles which are commonly asked by examiners. You can practice and prepare yourself before the test. Click here to know about all 3 parts of speaking test. What are disadvantages of smoking? Do younger people plan on getting married in your country? How do you get along well with your family? Describe your favorite subject at school. What are the most difficult things about your studying? What do you like or dislike about your home? Are computer labs necessary at school? Do you speak this language? Do you learn something from the movies? What equipment do you need for your favorite sport? Are clothes, expensive in your country? What kinds of games were popular when you were young? What are your country’s colors? Select a topic from the given IELTS speaking titles above talk 1-2 minutes and record yourself, then listen to yourself and rectify your mistakes. Click here to know how to take IELTS Speaking test. Awesome website with useful articles.